Fly Casino is pleased to spotlight Final Score, a new arcade style game whereby you can win big prizes by correctly predicting the outcome of a football match that you create. Easy and fun to play, you’ll love the opportunity to set one team against the other and watch the results. You can select from all the major European leagues and choose your two favorite teams from a league, the home team and the away team. You can also click on Random which will randomly assign two teams to play against each other. When you place a bet, you are wagering on the outcome of the game - either the home side or the away side will win or that it will be a draw. 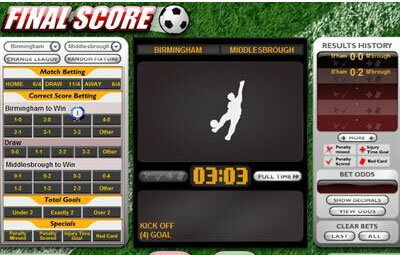 Correct score betting is where you predict the score line at the end of the match. The Total Goals bet enables you to bet on the number of total goals that will be scored by the two teams, regardless of who scored them or who won the match. The fourth bet is the Specials bet where you bet that a particular event will happen during the match. The events include Penalty Missed, Penalty Scored, Injury Time Goal and Red Card. When placing a bet you can run your mouse over the particular bet to see what the betting odds are. Try it this weekend – it’s a great game to take it slow and relax. Saturday April 5, 2014 00:00GMT until 23:59GMT on your first deposit of $/£/€10 or more our members are eligible for our exciting Your Choice bonus. Collect up to $/€/£ 100 free when you make your first deposit every Sunday during the month. You are entitled to receive a 50% up to $/€/£ 100 bonus immediately when you make your first deposit of $/€/£ 20 or more on any Sunday. On Monday April 7, 2014 from 00:00GMT until 23:59 GMT, all members on their first deposit of $/£/€40 or more will receive a $/£/€45.00 bonus. On Tuesday April 8, 2014 from 00:00GMT until 23:59 GMT all members on their first deposit of $/£/€35 or more will receive a 200% deposit bonus up to $/£/€200.00.